News about the Google Pixel 3 Lite has been quiet lately, but it could be set to launch imminently, as someone has seemingly got hold of the handset and it looks more or less finished. In a video, Andro News shows the Pixel 3 Lite in detail, revealing a design that's similar to the standard Google Pixel 3, but this time the phone is made of plastic. Other changes include a speaker on the bottom edge rather than the front, just a single front-facing camera, and a headphone port, which the rest of the range lacks. The screen meanwhile is apparently a 5.56-inch 1080 x 2160 one with an 18:9 aspect ratio and a pixel density of around 434 pixels per inch. 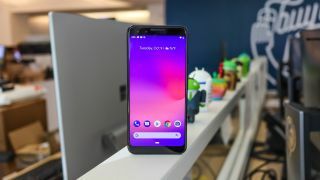 That makes it marginally bigger than and the same resolution as the 5.5-inch Pixel 3, but the source says it's easy to handle with one hand. The camera could be a highlight of the Google Pixel 3 Lite, as it apparently has a 12.2MP f/1.8 main camera with optical image stabilization, which is the same spec as the standard Pixel 3, and the photo quality is also supposedly comparable. There's apparently an 8MP camera on the front. Other specs are said to include a mid-range Snapdragon 670 chipset, 4GB of RAM and just 32GB of storage. The battery is supposedly 2,915mAh and the source claims it has similar life to the standard Google Pixel 3, though that's not necessarily great news as in our review we found it was sometimes a struggle to get a day of life from that phone. We'd take all of this with a pinch of salt, but it all lines up with what we've seen and heard before. There's no information here on when the Google Pixel 3 Lite might actually launch, but earlier leaks suggested it would land in the first half of 2019, and it certainly looks ready.